We actually did an early celebration of Flirburt Day this year, since cousins were going on vacation this weekend and wouldn’t be in town. So on Monday, we got our PURPLE ON! 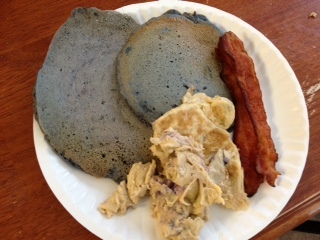 We started the day with yummy purple pancakes, purple eggs, and… well, just regular bacon! Then, cousins and friend came over, most everyone decked out in their best purple. 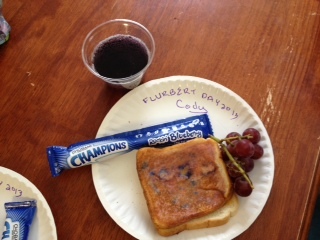 For lunch, we had purple grilled cheese, purple yogurt, purple grapes, and purple pop. 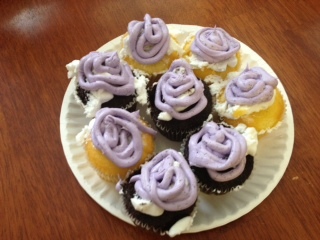 For dessert, we had some crazy looking purple cupcakes! I cheated… My sister had a TON of leftover cupcakes from sweet Pamela’s 1st birthday… so I cut off the frosting, colored it purple, and “re”frosted it. They look… interesting… but I thought it fit for Flirburt Day! Yes, it was a purply kind of day! If you’re wondering now just what exactly Flirburt Day is…. Well, DUH! It’s the day to celebrate the color PURPLE!!! From what I’ve been told, it’s inaugural year was 2012… when one of them marveled at the interesting fact that pop could actually be purple while playing a game of making up silly words. One thing led to another, and they decided this was super cool, and they needed a WHOLE DAY to celebrate this wonderful color, and would do so with their new made up word– Flirburt! 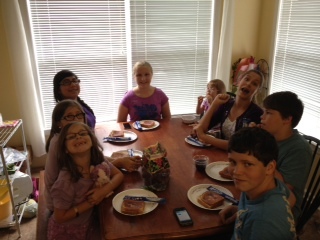 So, August 2nd was deemed Flirburt Day by the Phillips’ and Geselle kiddos. Let purple reign throughout the land today! Discussion: Anyone happen to be wearing purple today? Any fun ideas to come up with more “purple” food? And am I the only one who has kids who make up crazy holidays????? Ohhh, those are GREAT ideas! I was also thinking of those purple colored Tortilla chips! What fun! Kinda like a St. Patrick day except for purple. this sounds very fun! I have never heard of this but will have to make sure and celebrate next year!